2019's Pulitzer winners will be announced in just over a week. As a build-up, we have the first editions of the 1938 Pulitzer Fiction winner and finalists. The winner is John P. Marquand's "The Late George Apley". Marquand is pretty much forgotten today, and his books are rarely, if ever, seen in today's bookstores. But in his days, Marquand was a best-selling author, of formulaic and facile stories like the "Mr Moto" series, and of literary novels like Apley, who graced the covers of Life and Times magazine, and received a honorary doctorate from his alma mater, Harvard. 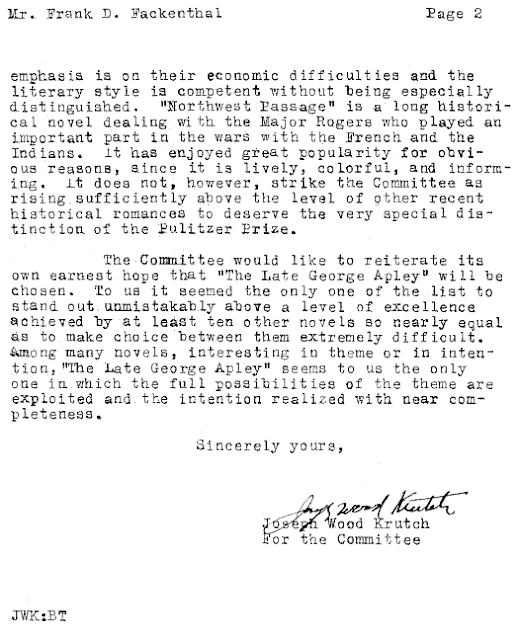 Apley is a satirical novel written in epistolary form, ostensibly to eulogized a Bostonian scion but really to poke fun at anachronistic values and traits. The Pulitzer juries, who unanimously recommended this book for the prize, wrote that it highlighted "those traits of the subject's character which a contemporary would have admired but which appear in a different light to a later generation". Upton Sinclair said that "it is very subtle and clever, and I am not sure that Boston will get it". I was lucky to have gotten a copy of this book with NF dust jacket, covering the age. Apart from Apley, we also have Josephine Lawrence's "The Sound of Running Feet" and Kenneth Roberts' "Northwest Passge". 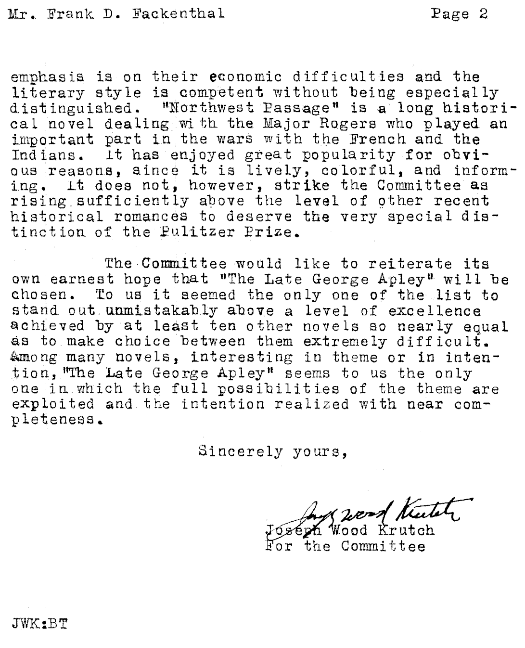 Pulitzer didn't officially announce the fiction finalists until 1980, but it was customary that the jury committee proposed at least 2 alternatives in their recommendation since the prize's inception. These alternatives were the finalists. 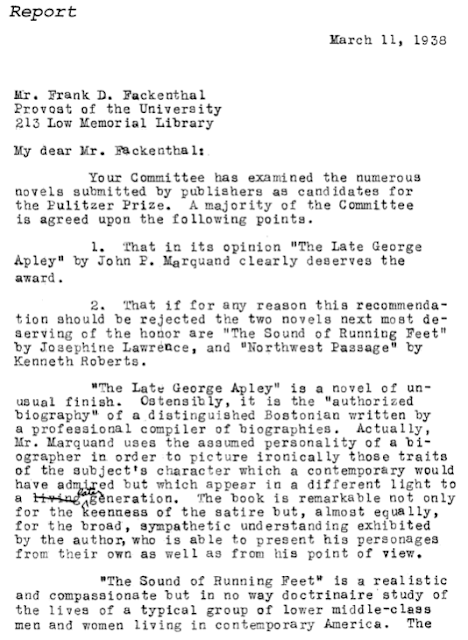 For the 1938 prize, the jury committee picked Running Feet, "a realistic and compassionate but in no way doctrinaire study of the lives of a typical group of lower middle-class men and women living in contemporary America", and Northwest Passage, "a long historical novel dealing with the Major Rogers who played an important part in the wars with the French and the Indians". The bibliography of Running Feet is now unclear, but I believe the copy I obtained is the first printing based on information on its copyright page. 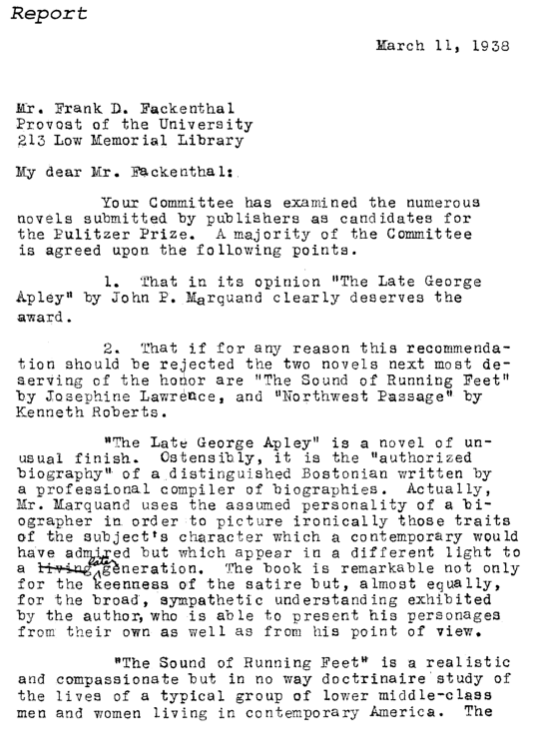 Northwest Passage's bibliography is clearer - interestingly this book seems to be still quite popular from first edition collection perspective, compared to Running Feet at least - and this copy is the first trade edition that was preceded by a special signed two-book set with slip case and dust jackets that, today, still sells at a rather hefty premium.